Depending on the type of trail surface, trail uses, budget and topography; there will be variations on routine maintenance schedules and equipment needed. There also can be a variety of agreements and partnerships to maintain rail-trails. The Mon River Trails Conservancy and Morgantown Board of Parks and Recreation that manages the Mon River, Caperton, Deckers Creek Rail-Trails, a 48-mile trail system in North Central, WV. The trail maintenance crew is made up of one full-time and one seasonal staff person plus in-mates when they are needed and available. 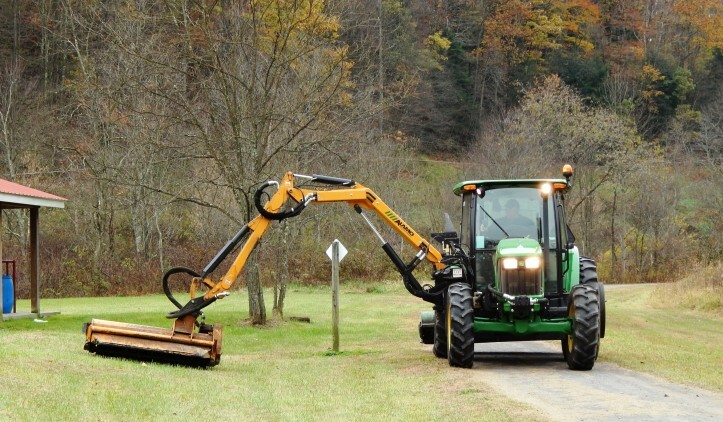 Culvert and Ditch cleaning at least 2 times a year to clear ditches of leaf, mud and rock debris. Mowing the trail sides every 2 to 3 weeks on a continuous rotation for 48 miles of trail. Cleaning restrooms and emptying trash containers twice a week. Clearing downed trees and landslides, weed-eating fence lines, restoring stone at ingress and egress of bridges, checking bridges, culverts, signs, mile-markers, gates and fences for upkeep. Trail users are often the best eyes on the trail and can report maintenance issues such as downed trees and call in illegal activities such as motorized use or vandalism. If you are witnessing the crime, encourage trail users to call 911 and report it to the local law enforcement. Signs posted along the trail or on gates that make it easy to have a phone number for calling to report issues. Trail users are the ones that care the most about the trail. By encouraging their involvement in reporting issues and a stewardship ethic, you develop a stronger commitment to support the rail-trail with time and funding. Trail maps, website and social media are good places to promote the trail, teach trail rules and etiquette, and encourage trail users to be involved in its upkeep. It is valuable to have a trail contact person to answer questions about trip planning. This might be staff of the trail managing agency, or it could be the local or regional Convention and Visitors Bureau, Parks Department, or a local business like a recreation outfitter. Make this contact information easily available, it is not always clear who is managing the rail-trail. Clear signs on the trail rules and etiquette should be posted at trailheads. This also will be an opportunity to get the word out on who manages the rail-trail.